New never before offered Windshield wiper pivot, crank arm spacer & link retainer pkg. Fit 66-67 A & Body cars. USA made designed & patterned from originals. 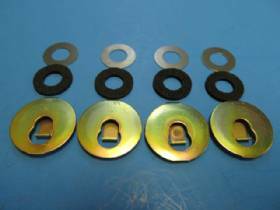 Correct size thickness special steel washer & felt type washers. Much needed to tighten, remove slop from the links & your wiper system. New never before offered Windshield wiper pivot, crank arm spacer & link retainer pkg. Fit 70-74 E, 69-71 B & 69-71 A body. USA made designed & patterned from originals. 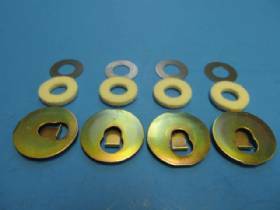 Correct size & thickness special steel & very tight closed cell sponge washers. Much needed to tighten, remove slop from the links & your wiper system.